No workspace is quite complete without the right desk lamp to tie everything together. Task lighting can help you to work more comfortably at your desk and creates an ambient office environment. 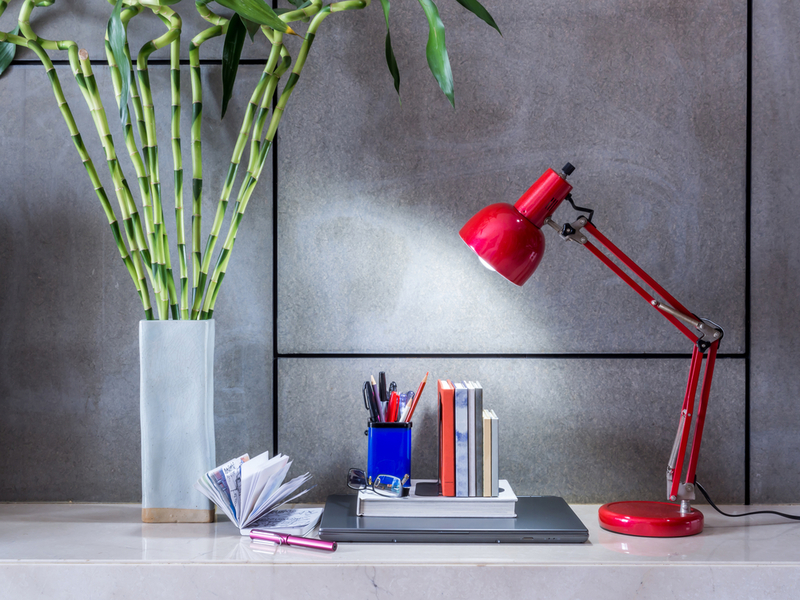 It can be a challenge to choose the best desk lamp for your space, and so we’re here to help. We’re going to go over what you should look for in a desk lamp and our top five favorite options. Do You Need a Desk Lamp? 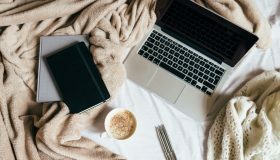 A desk lamp not only makes your workspace look more professional but can also help to improve your comfort and productivity throughout the day. When working in a dark or poorly lit area, we tend to lean forward or sit at awkward angles to better see what’s on our desk. This places stress on your body, however, leading to neck, back, and hip pain or even long-term damage to your posture. Your eyes may also suffer from poor lighting. While experts say that reading in low light is not likely to cause permanent damage, it may strain your eyes or give you a painful headache. Staring at a screen in the dark can also exacerbate eye strain, causing temporary dryness, irritation, and blurred vision. This applies to devices both with and without backlighting. If you’re an older adult, a desk lamp can offset the natural age-related decline in vision that most of us begin to experience in our 40s. In fact, studies have shown that people in their 60s need around three times more light to read comfortably than people in their 20s. When shopping for a desk lamp, we all have a different set of requirements. No matter what you’re looking for, though, there are a couple of key features that you should consider before making your final decision. The most important consideration for any desk lamp is the quality of light its bulb produces. You want to illuminate your workspace with clear, bright light in a focused beam. If you work with screens, it’s also best to look for a lamp with minimal glare. It’s a good idea to look at the Color Rendering Index (CRI) of a light to see how well it will serve your workspace. This value measures how true-to-life colors look underneath a light source using a 0 to 100 scale, with higher numbers giving truer colors. For desk lamps, you should aim for a CRI rating of 85 or higher. If you’re an older adult or have impaired vision, you may want to look for a lamp with a higher CRI, as it will give colors more contrast. Color temperature is another factor to consider when looking at bulbs. 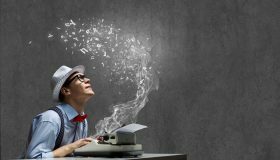 “Warm” lights give off a yellow tint, which many people prefer when working with books or paper. A “cool” blue tint, however, is often preferable when working with screens. You can measure color temperature using the Kelvin (K) scale. 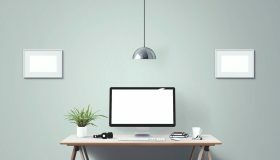 Desk lamps in homes are typically 2700K to 3000K, which is in the warm range, while those used in offices are generally a cooler 3000K to 3500K. The temperature of a lamp’s light depends primarily on the type of bulb that it uses. Traditionally, most desk lamps have used incandescent bulbs, which give off a warm glow. These bulbs are cheaper than most alternatives, but are also less energy efficient and burn out more quickly. LEDs are another popular choice for desk lamps. While these bulbs naturally give off a cool light, nowadays you can find LEDs in a wide variety of tints. LED lights use less energy and give off less heat, making them safer than incandescents. 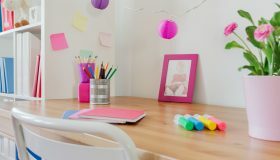 While some desk lamps stand fixed in place, many options offer some degree of flexibility in the form of a swiveling head, a swing or boom arm, or a gooseneck body. Adjustable lamps are able to cover a wide range of space. You can fine-tune the placement of the bulb to sit shine directly where you need it without causing glare. You can also move the lamp out of the way when it’s not in use, helping you to save some space. Whether you get an adjustable lamp or not, it’s important to consider how you’ll position the lamp in your setup. In general, you want a light source to cover your entire work area, but you don’t want it in your line of vision. It’s best to position a desk lamp slightly above where your head rests when seated. Don’t place it too high, however, or you may deteriorate the light quality. You also don’t want to have your desk lamp at an angle where it will catch shadows. 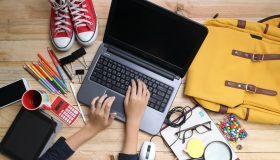 If you’re right-handed, you should place your light on the left side of your desk, while left-handed people should keep their desk lamp to the right. This sleek looking desk lamp has a modern design that comes in either a black or white casing to match your office decor. The lamp is easy to position to your liking, with a head, arm, and base that can each be rotated and adjusted separately. Touch-sensitive controls make it easy to switch between five brightness settings. A bulb with a color temperature range between 2000K and 5500K offers light that’s easy on the eyes and won’t cause a glare on screens, while a CRI rating of over 90 offers plenty of contrast. 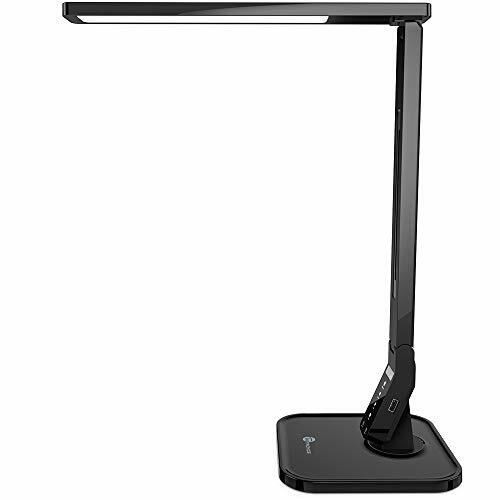 The TaoTronics Charging LED Desk Lamp also features a built-in USB outlet. You can charge your devices without taking up computer ports or desk space. This desk lamp is specifically designed to be gentle on the eyes. It offers even, flicker-free lighting so that you can avoid eye strain and headaches. 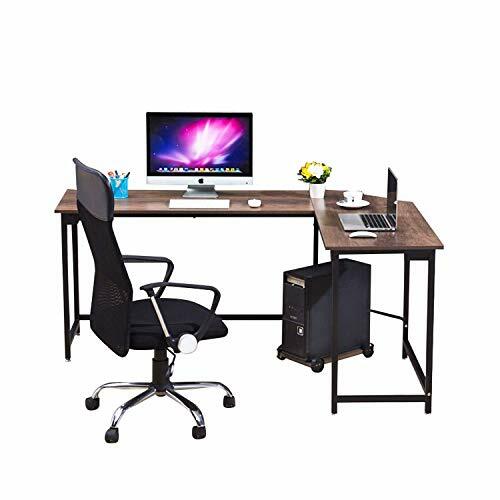 Its modern design fits well with most office decor, and you have a choice between a black, white, or wood grain finish. 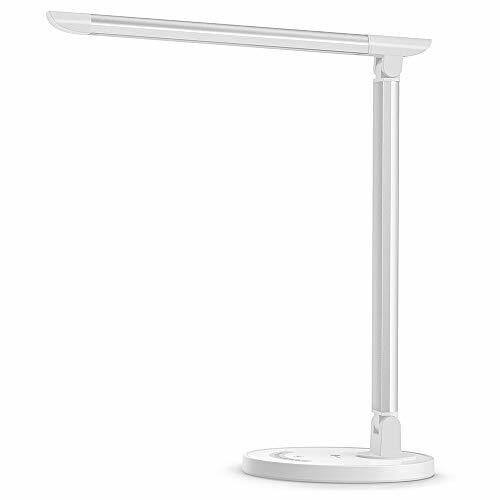 The casing, made of anodized aluminum, gives the lamp extra durability. Both the neck and the head are adjustable to allow for more control over your setup. The lamp offers five color modes along with seven brightness levels, allowing you to completely customize the quality of the task lighting in your workspace. You can choose between temperatures ranging from a warm 2700K to a cool white 6000K. With four lighting modes and five brightness levels, this lamp allows you to fine-tune the task lighting in your office to your liking. It has a touch-sensitive control panel for easy adjustments. A CRI of over 90 offers plenty of contrast between colors, even for those with poor vision, while an even quality of light protects you from any strain. If you’re not around to turn the LAMPAT desk lamp off, it has a one-hour auto shutoff mode to ensure that you don’t accidentally waste any energy. 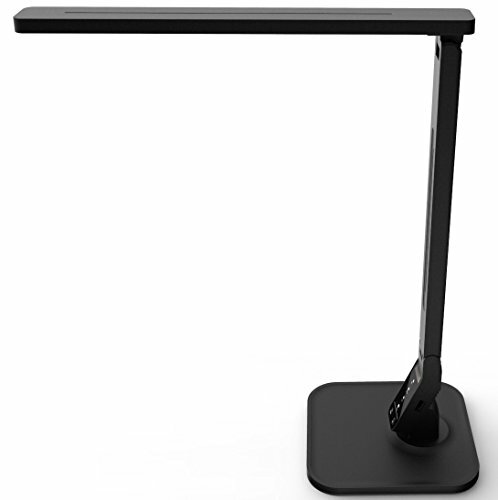 A USB charging port built into the adjustable body of this desk lamp allows for easy charging. The port is located on the side of the arm to keep your devices out of the way while you work. Instead of sitting on your desk this lamp clamps on, helping to free up more space. 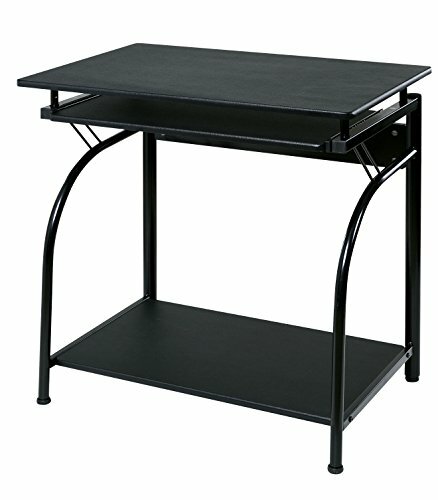 This feature makes it ideal for smaller workspaces. 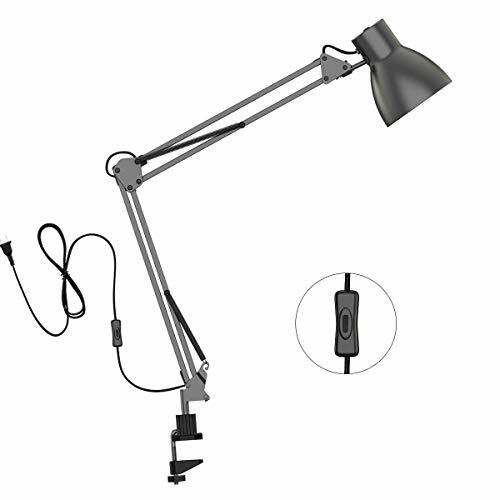 The long twin arm is fully adjustable, extending up to 32” to offer plenty of light for your desk space without getting in your eyes. It features four springs for balance and three rotatable metal joints for smooth movement. The ToJane Swing Arm Desk Lamp is built to withstand heavy use, with a 0.6mm molded metal construction and a painted finish. A lampshade with strategically placed holes helps to improve heat dissipation, while an LED bulb reduces overall energy usage. It gives off a neutral 3000K to suit just about any work environment. This desk lamp is designed in the classic banker’s style for a timeless look. 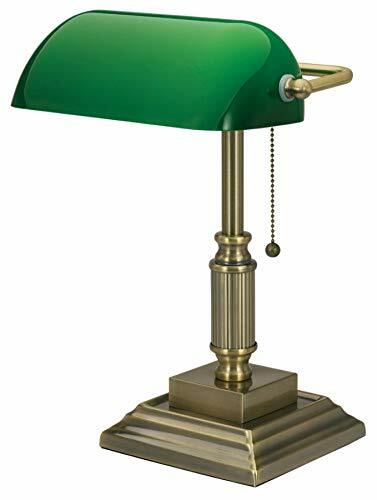 A green glass shade and an elegant antique brass finish help to add a touch of class to any office. The base of the lamp is made of solid metal, helping to stabilize the top-heavy design. It can withstand heavy use without cracking or breaking. The lamp turns on and off using a chain pull-string, which is often more reliable than the touch screens found on many modern lamp designs. The V-LIGHT takes a CFL bulb, which is slightly more expensive than an incandescent but also uses about 70% less energy. Our favorite lamp is the TaoTronics Charging LED Desk Lamp. It has a fully adjustable design and multiple settings so that you can customize the quality of the task lighting in your office. The lamp even comes with a convenient charging port built into the body. Though everyone might have different needs when it comes to lighting, we can all benefit from adding a desk lamp to our workspace. Task lighting can help to alleviate discomfort while you work, improving both posture and productivity.